Please note that RENEW is now finished and the data are currently being analysed and written up. The RENEW study is concerned with the impact of moving to new residential environments on travel and physical activity patterns and wellbeing. There is increasing interest in building sustainable and healthy neighbourhoods as a means of tackling carbon emissions and encouraging people to live healthier and more sustainable lives. The UK Government’s recent report Laying the Foundations: A Housing Strategy for England states that ‘High quality homes in high quality natural environments will support our plans for growth and are necessary for social, environmental and economic sustainability.’ Similarly, the National Institute for Health and Care Excellence points out that the design and layout of neighbourhoods can influence residents’ travel and physical activity behaviour. Increasingly, researchers are studying aspects of the built and social environment as key factors that promote active travel with less reliance on cars. These factors might include safe, aesthetically pleasing routes for walking and cycling or access to green space. Ultimately, the neighbourhoods we live in have the potential to affect our health and how sustainably we live our lives. There is, however, very limited evidence on the effects that moving to new neighbourhoods can have on the health and sustainability-promoting behaviours of residents. 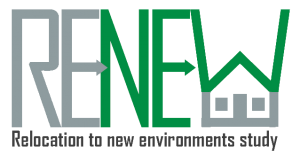 RENEW aims to contribute to the process of building this evidence.